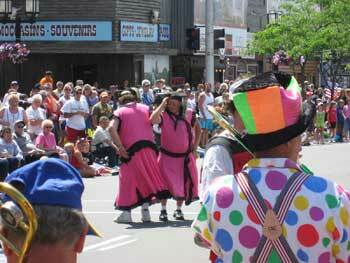 When you see the Scottville Clown Band, you're amused by their colorful attire and crazy antics. When you hear them play, you're amazed at their extraordinary talent. They've been entertaining crowds in Michigan for over 100 years, with no sign of slowing down. Perhaps their best performances are during the summer parades, with "The Stripper" being the favorite number. The horns, cymbals, and drums give the Clown Band their other name, "The Big Noise from Scottville." Here is the 2019 local schedule. Check back for updates. 12 - Jaycees Summer Kickoff Concert, 7pm, Waterfront Park, Ludington. 2 - Scottville Clown Band Patriotic Concert, 7pm, Scottville. 4 - Manistee National Forest Fest Parade, 10am, Manistee. 4 - Ludington Area Jaycees Freedom Festival Parade, 2pm, Ludington. 7 - Beach Show, 4pm, Manistee. 13 - Bear Lake Days, 6pm, Bear Lake. 18 - Troutarama Concert, 8pm, Baldwin. 20 - Troutarama Parade, 1pm, Baldwin. 22 - Portage Lake Concert, 7pm, Onekama. 28 - Arcadia Daze Parade, 1:30pm, Arcadia. 8 - Les Bailey Memorial Concert. 7:30pm, Pentwater. 10 - Homecoming Parade, 4pm, Pentwater. 20 - Summer Concert Series, 7pm, Scottville. In 1903, a musical group of Scottville merchants dressed up as hillbillies and began entertaining at local carnivals. Their popularity grew until World War II called its members away and the group disbanded. In 1947, a local businessman, Ray Schulte, resurrected the group, and to this day, the Scottville Clown Band continues to bring smiles to countless faces. The city of Scottville is located ten miles east of Ludington, with about 1,200 residents. This small town has certainly been put on the map through the notoriety of the Scottville Clown Band. Clown Band members come from all over Michigan and over 14 other states, including Florida, New York, Tennessee and California. They represent all walks of life, from police officers and farmers to doctors, bankers, and disc jockeys. The members are represented by a board of directors, a group of people that make decisions on band operations and policies. Their charitable contributions include funding and maintaining both the Scottville Clown Band Shell and the Museum of Music at Historic White Pine Village. One of the primary goals of the Scottville Clown Band is to provide scholarships for students accepted to summer programs for any of the performing arts, including vocal music, theater, or instrumental music. Each year money is given out to over 30 students, helping them with costs to places like Blue Lake Fine Arts Camp and Interlochen. 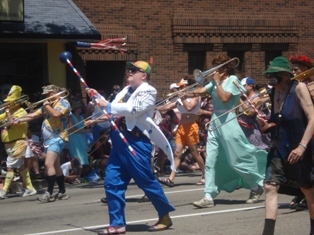 The scholarship recipients are invited to play with the Scottville Clown Band in early summer at a concert performed at Waterfront Park in Ludington. 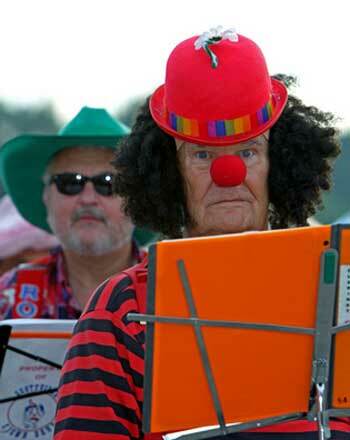 Funny guys who make some serious music--our lives are a little richer, thanks to the Scottville Clown Band. Go to: Scottville Clown Band for more information on the scholarship program.